This careful analysis of the terrible wildfires in the San Francisco Bay Area is republished with permission from MillionTrees, a website that fights to prevent unnecessary tree removal in the Bay Area. Recent wildfires in the North Bay were devastating. At least 42 people were killed by the fires and over 8,000 structures were destroyed, including homes and businesses. We don’t want to portray that fire as anything other than a tragedy. However, for those with a sincere interest in fire safety, there are many lessons to be learned from that fire. If people will open their eyes and their minds to the reality of those fires, there are opportunities to reduce fire hazards revealed by those fires. If you weren’t watching the news during the fires, you might start by looking at these videos. There are many more videos on the internet of those fires. The fire front moved rapidly through native conifers and oaks as well as through grassland and chaparral. After watching hours of these videos, we did not see any eucalyptus trees on fire. Many homes burned without igniting the trees and vegetation around them. If the photo was taken while the home was still burning, the vegetation is rarely engaged in the fires. If the photo was taken after the home burned, much of the vegetation is burned as well. In other words, the burning homes ignited the vegetation, not vice versa. In videos of actively burning homes, the air is filled with burning embers. The source of those embers cannot be determined from the videos. Nothing in these videos suggests that native vegetation is less flammable than non-native vegetation. Nothing in these videos suggests that the vegetation is more flammable than the structures that burned. CalFire has identified the specific locations where four of the fires originated. Two are in groves of oak trees and two are in grassland and chaparral. Photos of those specific locations are available HERE. What role did the weather play in the fire? All sources of information about the fire reported that strong winds were the biggest factor in the rapid advance of the fire. The wind was associated with very high temperatures and it came from the east. This type of wind is called a Diablo Wind in Northern California. In Southern California it is called Santa Ana Winds. In the Mediterranean, it is called Mistral Winds. In coastal Mediterranean climates such as California and the Mediterranean regions of France and Spain, the wind ordinarily comes off of the ocean. Because the ocean is cooler than the land, the wind is usually a source of moisture and cooler temperatures. During periods of high summer temperatures, the wind sometimes shifts direction and starts to blow off the hot interior, drying the vegetation and increasing temperatures. Most wildfires in California are caused by strong, dry, hot winds. Everything burns in a wind-driven fire. Both native and non-native vegetation burns in a wind-driven fire. Homes in the path of a wind-driven fire are more likely to burn than the vegetation that surrounds the homes because the vegetation contains more moisture. Why are wildfires becoming more frequent and more intense? Wildfires are becoming more frequent and more intense all over the world because of climate change. Temperatures are higher, drought is more frequent, strong winds are more frequent. Wildfires in the west have become more severe because of increased temperatures and lower humidity at night. When it doesn’t cool off at night, the trees don’t have an opportunity to regain the moisture they have lost during the high daytime temperatures. In the past, firefighters could count on wildfires to die down at night. Now they can’t count on colder nights to make the fires less severe. (2) Since the fires in the North Bay started in the middle of the night and did the most damage that first night, this observation about warmer nights is particularly relevant to those fires. Deforestation is the second greatest source of the greenhouse gases causing climate change. Every healthy tree we destroy releases its stored carbon as it decomposes. Every tree that dies of drought releases its carbon as it decomposes. Every tree that burns in a wildfire releases its carbon as it burns. What role did power lines play in the fire? The investigation of the recent wildfires in the North Bay is not complete, but early indications suggest that power lines probably ignited some of the fires. Some power poles fell over in the strong winds, causing the power lines to break and spark ignitions. Some trees were blown into the power lines, causing them to break or spark. California State law requires that trees be pruned at least 4 feet from the power lines. Although PG&E says they are inspecting thousands of miles of power lines to identify potential interference with trees, these inspections are apparently not adequate. After the fires started, PG&E claimed they had removed 236,000 “dead and dying” trees and “destroyed or pruned” 1.2 million healthy trees in 2016. These destroyed trees contribute to climate change. California State law also requires that power poles are capable of withstanding winds of a certain velocity. However, power poles fell over during the recent fires when wind speeds were below that standard set by State law. Apparently PG&E’s efforts to inspect and maintain power lines were inadequate and State laws intended to ensure the safety of power lines are not being enforced. Did Sudden Oak Death contribute to the fire? Dead trees are more flammable than living trees because living trees contain more moisture. In addition to more than 5 million dead oak trees in California, 102 million native conifer trees in the Sierra Nevada foothills were killed by drought, warming temperatures and native beetle infestations during the drought years. All of these trees are native to California. This is another indication that native trees are not less flammable than living non-native trees. The ranges of native plants and animals are changing because of climate change. They must move to find the climate conditions to which they are adapted. Native plant “restorations” that attempt to reintroduce plants where they existed 250 years ago, prior to the arrival of Europeans, do not take into consideration that the plants may no longer be adapted to those locations. That’s why many “restorations” are not successful. If you haven’t seen the Sutro Forest, you should do so soon. The plans are to destroy about 50% of the trees and most of the understory. Native plant advocates have their heads in the sand about Sudden Oak Death. 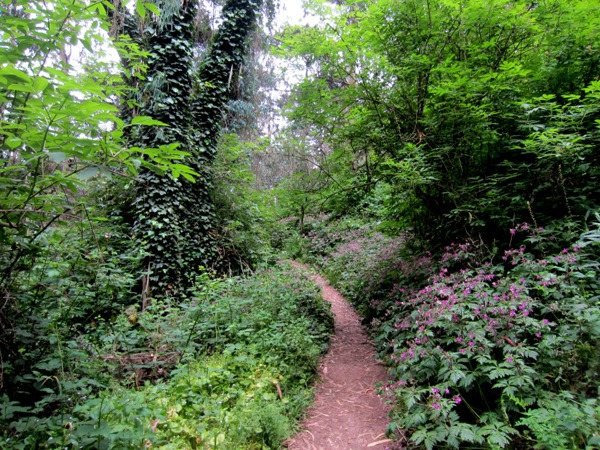 The recently published Environmental Impact Report for San Francisco’s Sutro Forest announced UCSF’s intention to destroy about 50% of the non-native trees on Mount Sutro and replace some of them with native trees, including oaks and bays. Bays are the vector of the pathogen causing SOD. The EIR said NOTHING about Sudden Oak Death, nor did it acknowledge the existence of the disease in Golden Gate Park and the arboretum, less than a mile away from Mount Sutro. What’s the point of destroying healthy trees and replacing them with trees that are likely to die in the near future? We must address the causes of climate change. We must stop destroying healthy trees and we must plant more trees. We must choose species of trees that have a future in the changed climate. The trees must be adapted to current and anticipated climate conditions. We must quit destroying trees simply because they are not native. Non-native trees are not more flammable than native trees and many are better adapted to current climate conditions. We must regulate our public utilities and demand that regulations be enforced. The Public Utilities Commission initiated an effort to improve the safety of power lines in 2007, after destructive wildfires. The utility companies have been actively dragging their feet to prevent new regulations because they would increase costs, despite the fact that they would improve safety. Improved regulation of utilities should minimize the need to destroy healthy trees, by undergrounding power lines in the most high-risk areas, improving insulation of the wires, replacing wooden power poles with metal and/or concrete poles, installing sensors that identify breaks in the power lines, etc. Demonizing non-native trees is preventing us from addressing the causes of climate change and the closely related issue of increasing frequency and intensity of wildfires. Let’s open our eyes and our minds to the reality of wildfires in California and develop the policies that will reduce fire hazards. Thanks for rational objective review of fire causation. This points out the irrational unscientific beliefs of the nativist cult. They are a serious threat to common sense forest management. I’m a native San Franciscan and live in Sonoma county now. We were thankfully saved from the fires. I see that non native trees burn equally the same as native do. Why must we cut down what are already mature trees? They lend us so much oxygen and shade. Our neighbor cut down 100 eucalyptus which housed 100s of birds and was a total wind shield. It seemed like an act of insanity and yet I’m sure he thought he was helping something??? I really pray that you can help stop this and figure it all out. It’s just horrible.